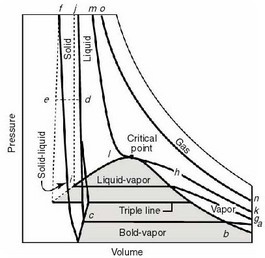 Energy, volume, enthalpy are all extensive properties. Their value depends not only on the temperature and pressure but also on ``how much,'' i.e., what the mass of the system is. The internal energy of two kilograms of air is twice as much as the internal energy of one kilogram of air. It is very often useful to work in terms of properties that do not depend on the mass of the system, and for this purpose we use the specific volume, specific energy, specific enthalpy, etc., which are the values of volume, energy, and enthalpy for a unit mass (kilogram) of the substance. For a system of mass , the relations between the two quantities are: , , . MP 1..2 What is the difference between extensive and intensive properties? Intensive properties are properties that do not depend on the quantity of matter. 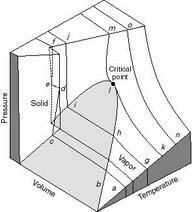 For example, pressure and temperature are intensive properties. Energy, volume and enthalpy are all extensive properties. Their value depends on the mass of the system. For example, the enthalpy of a certain mass of a gas is doubled if the mass is doubled; the enthalpy of a system that consists of several parts is equal to the sum of the enthalpies of the parts. MP 1..3 How do we know when work is done? A rigorous test for whether work is done or not is whether a weight could have been raised in the process under consideration. I will hand out some additional material to supplement the notes on this point, which seems simple, but can be quite subtle to unravel in some situations.